New years often mean new beginnings. We reflect on the previous year and make resolutions to become new, better versions of ourselves going forward. It’s in the spirit of new beginnings that I’d like to announce that The Craving Chronicles will be turning over a new “leaf” on 2012: all vegetable recipes, all the time. I’m giving up sugar. No more cakes, cookies or chocolates. Just veggies. Oh, don’t panic. I’m just kidding! Like I could ever give up sugar. Or chocolate? I mean, really. It’s like you don’t even know me. I’m afraid this recipe is a bit late. I was hoping to share it with you earlier, but then I was striken with the plague. (I got better.) I suppose we’re all done with and over the holiday flavors and egg nog by now but I wanted to share this recipe with you anyway, before it gets lost in my archives, because it’s both easy and delicious. 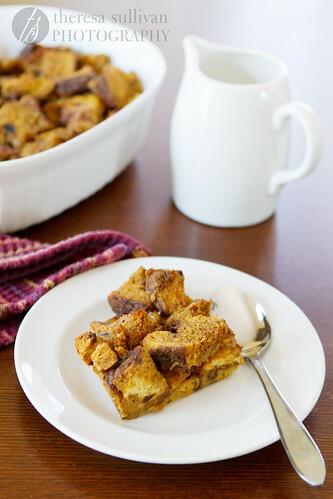 The bread pudding tastes like a cross between french toast and a lightly spiced gingerbread. It’s fine alone, but paired with the eggnog sauce I wanted to lick all the creamy spiced goodness off my plate. Gingerbread Bread Pudding with Eggnog Bourbon Sauce is packed with holiday flavors, making it an ideal sweet ending to your big family feast. 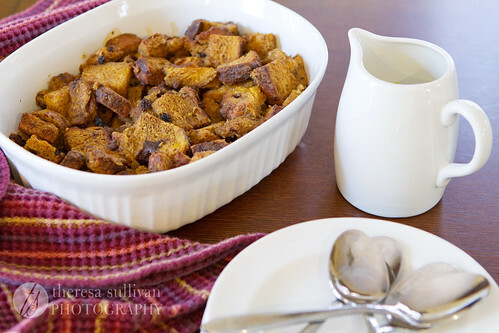 It can also double as a holiday breakfast treat because it’s somewhat like french toast! My favorite way to eat this was with warm bread pudding and chilled egg nog sauce, for that irresistible hot and cold combination. This bread pudding could also be made in individual ramekins for cuter presentation – just shorten the baking time appropriately. Preheat oven to 350°F. Coat a 1 1/2 quart baking dish with butter or baking spray. 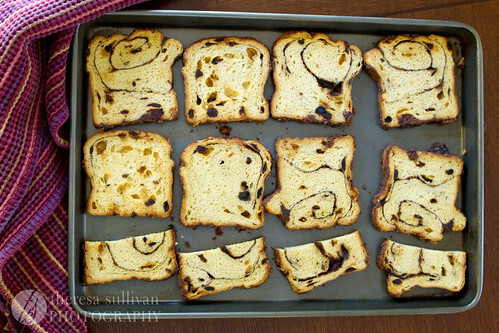 Lay cinnamon raison bread in a single layer on a baking sheet. Bake 10-15 minutes, watching carefully, until bread is lightly toasted. Remove from oven. While bread cools, in a large bowl whisk together remaining ingredient, milk through egg yolks. Slice toasted bread into roughly 1-inch cubes. Toss toasted bread cubes in milk mixture, making sure to coat all the bread. Dump soaked bread and any remaining liquid into prepared baking dish. Bake at 350°F for 20-25 minutes, or until set. Serve warm topped with Bourbon Egg Nog Sauce. In a medium saucepan, whisk eggnog and egg yolks combine. Cook over medium-low heat, whisking constantly until thickened, 5-10 minutes. Remove from heat. Whisk in bourbon and cinnamon to taste. Serve warm, or chilled for a thicker sauce. Holy cow, I can think of five people who would love to eat this right now, myself included! Thanks for sharing. Yum! This looks great! Bourbon included, what more could we ask for?? lol I’m going to make this over the weekend and so looking forward to it. We have a gathering going to be over so I figured this would be a good time to try it out!! 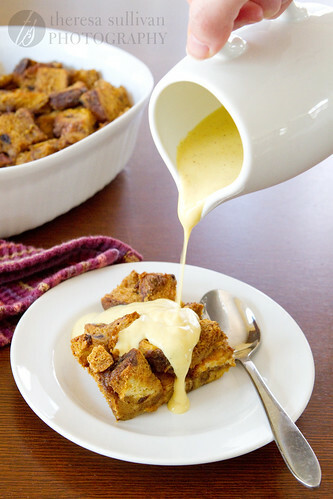 I love bread pudding and that sauce looks incredible!